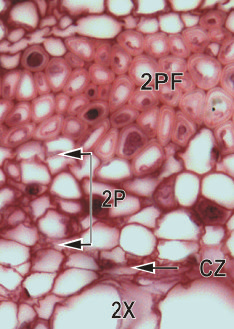 This cross section of part of a pea root, shows the development of secondary vascular tissue which is derived from the interfascicular cambium (CZ). Secondary xylem elements (2X) and secondary phloem 2P) elements are visible in this micrograph. The secondary phloem is capped and protected by a band of phloem fibres (2PF). What do you think the darkly-stained material within the cells of the secondary phloem is?